Australian shares have closed lower on a mixed day of trading as positive gains from the energy sector were wiped by CSL and materials sector losses. 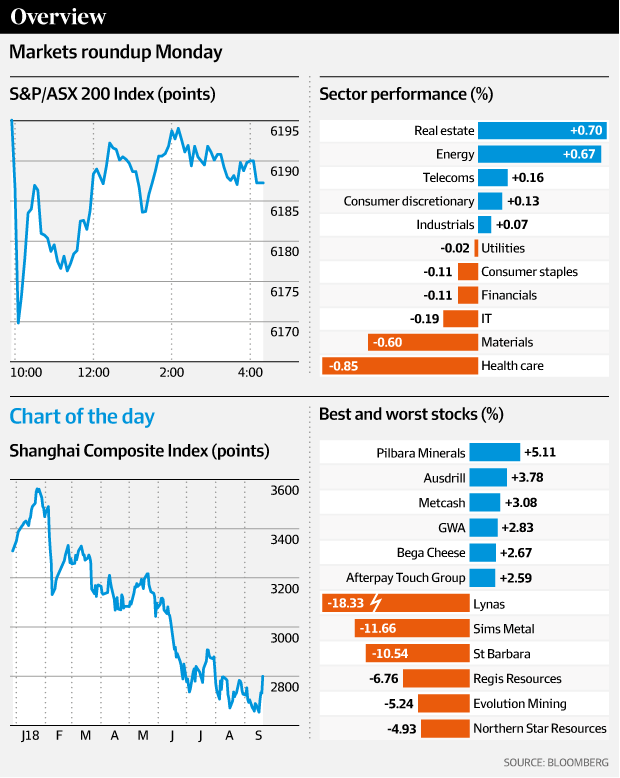 The S&P/ASX 200 index closed 7.7 points, or 0.1 per cent, lower at 6186.9, rallying from a 25 point loss at the open. It was a mixed day of trading across the market, with the major banks and miners trading in both the green and red through the session. CSL led the market losses for the session despite a small rally in the middle of the day. Its shares closed 1.4 per cent lower at $204.32. A2 Milk fell 3.8 per cent to $10.87 after chief executive Jayne Hrdlicka sold her entire stake in the business last week, wiping two weeks worth of gains. Ms Hrdlicka sold her shares in order to meet tax obligations and pocketed $4.4 million from the sale. How the market performed on Monday. Lynas Corp shares fell 18.3 per cent to $1.72 over fears its operations in Malaysia could be threatened by a government review. Reports in the Malaysian media suggest that the rare earths miner could come under threat from the review, which is set to be led by Malaysian parliamentarians who are known to be hostile toward Lynas. The company’s operations in the country have been surrounded by controversy since it constructed its first refinery in the country in 2012. Sims Metal Management provided a poor first quarter update, causing its shares to fall 11.7 per cent to $11.82. Its earnings for the quarter fell on the back of lower intake volumes and Zorba (a mix of shredded and pre-treated non-ferrous scrap metals) sales facing a difficult market. Regis Resources confirmed it had made a confidential and incomplete takeover offer for Capricorn Metals which values the company at $85.3 million. The 11.4 cents a share offer has been unanimously supported by the Capricorn board but is yet to receive the support of Hawke’s Point, which owns a 19 per cent stake in Capricorn. Regis Resources closed 6.8 per cent lower at $3.86 while Capricorn Metals shares rose 50.9 per cent to 8.9¢. ​The energy sector lifted on the back of strong oil prices on Monday, with Brent crude rising by more than 1 per cent to be just a few cents away from $US80. Woodside Petroleum closed 0.3 per cent higher at $37.06, Oil Search advanced 1.5 per cent to $8.74, Santos rose 1.7 per cent to $7.13 and Origin closed at $8.02, up 0.8 per cent. BHP Billiton was also among the market leaders on Monday, rising 0.7 per cent to $33.83. Morgan Stanley lifted its valuation on Premier Investments on the back of its 2017-18 results. The company, which owns brands such as Smiggle, Just Jeans and Peter Alexander, delivered an in-line result with accelerating sales in the fourth quarter and the first five weeks of 2018-19 giving the broker some cause for optimism. The broker highlighted in particular the longevity of the global growth opportunity for Smiggle as a premium children’s brand. It said that good online traction and further progress in its offshore expansion were key to its raise valuation. The broker added that it required more clarity on the unit economics of the revised European growth plans before it became more positive. Morgan Stanley raised its price target for Premier Investments from $13.20 to $19.00. The Chinese stock market recorded its best weekly result in more than two years last week as it lifted away from a near four year low. The Shanghai Composite index advanced 2.5 per cent to 2,797.48 points on Friday, the index’s best week since March 2016. Investor sentiment in the country was boosted last week on the hope that the Chinese government would be able to boost domestic demand in order to offset the effects of tariffs in the escalating trade war. China’s cabinet on Thursday ordered policies and resources be aimed toward boosting the tourism and sports sectors in order to increase domestic production. Copper surged higher on Friday, shrugging off concerns of an escalation in the trade conflict between the US and China. The price of copper jumped 4.6 per cent on the London Metal Exchange on Friday, hitting $US6363 a tonne, a fresh two-and-a-half month high. The surge came mainly on the back of declining stockpiles, with data showing London Metal Exchange inventories have fallen 19 per cent during September and are now down 45 per cent since the end of the first quarter. The Shanghai Futures Exchange’s inventories have also been in decline with stockpiles are currently sitting at their lowest levels in almost a year. The Australian dollar traded just below the US73¢ mark during the back end of last week but could press higher depending on how the US dollar reacts to the Federal Open Market Committee meeting on Wednesday. The FOMC is widely expected to lift the Funds rate on Wednesday but market watches will be looking for signals that the Funds rate is moving closer to the “neutral” mark, something that could add to the downside risk to the greenback. CBA senior currency strategist Joseph Capurso said he expected the Aussie to face resistance around US73.05¢, its 50 day moving average. Australia’s listed companies will pay out a record level of dividends this month, with $13 billion of the total $18.9 billion set to be paid this month being paid this week. 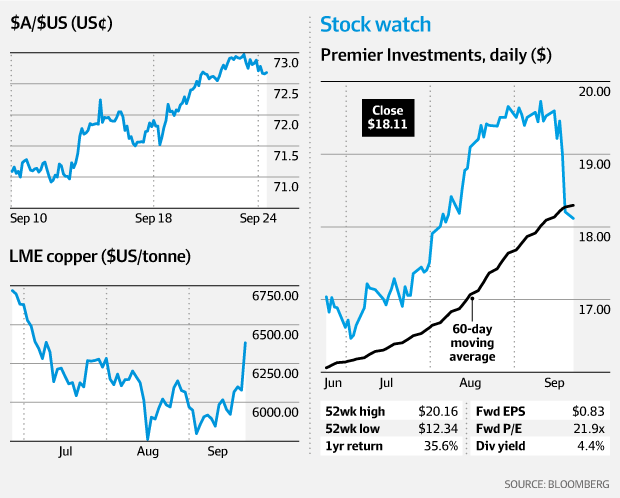 BHP Billiton will pay an increased dividend on Tuesday while Telstra and AMP will pay out vastly reduced dividends on Thursday. Telstra has been forced to cut its dividend by 29 per cent and will pay shareholders 11¢ dividend. AMP will pay out 10¢ to shareholders, a 31 per cent fall from the previous year. Overall, the total amount of dividends set to be paid during the 2019 fiscal year is set to rise by 4 per cent from the previous year.